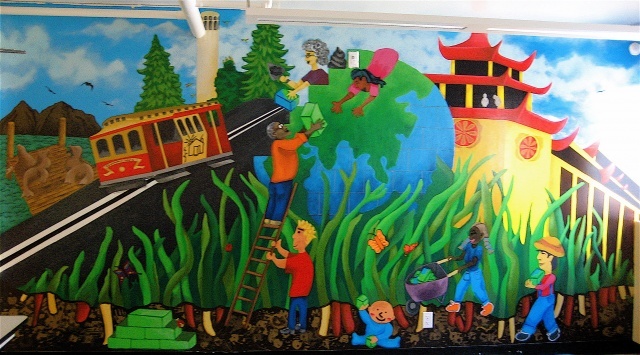 As part of Tel-hi’s final rebuilding and reconstruction period during its 4-year renovation plan, this mural project was initiated to celebrate and highlight its process of completion through themes of community, peace and nods to the surrounding neighborhoods in which its participants live. Staff and members of all age groups contributed to its development over the course of four weeks, from preschoolers’ handprints creating a texture in the soil, to a senior’s brushstroke highlighting a blade of grass. With the artist's help, kids K-8th grade worked diligently painting this wall to brighten and rejuvenate the art room during their summer break. Just as Tel-hi’s founding members, Elizabeth Ashe and Alice Griffith started from the ground up, in true grassroots form, these re-beautification projects too, began below the surface, by way of the very people that helped paint this wall. This mural is meant not only to inspire budding artists, but to remind all who see it that through the power of togetherness, something great can be achieved.